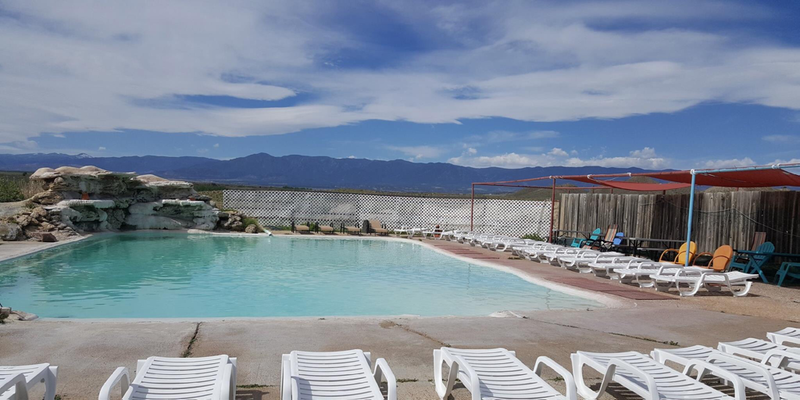 General Description: Desert Reef Hot Springs​ is a ​clothing optional family hot spring resort in Royal Gorge Country, Colorado. The Desert Reef Hot Springs boasts a private hot spring pool on ten acres for members, their guests and visitors. Day use only. Location: From Pueblo, Colorado is 30 miles or about 45 minutes to drive to the hot springs. Accessibility: Desert Reef Hot Springs​ ​is accessible. You can drive up to the resort. It is an easy walk around Cottonwood. The facility has limited handicap accessibility. Hot Springs: ​Desert Reef Hot Springs flows naturally from an artesian well located on the resort. Desert Reef has a source of 132 degrees. The geothermal mineral water is cooled by the air convection, and water temperature is adjusted seasonally to maintain an ideal soaking temperature. The hot springs pool measures 36' x 50' and holds 40,400 gallons of water. The hot spring pool is graced with a dramatic waterfall. The temperature changes seasonally. Winter average is 100-102 degrees. ​Summer average is 94-96 degrees. The mineral water is not treated. The geothermal water is pure mineral water. Hot Spring Tips: ​Desert Reef Hot Springs only offers day use. Desert offers membership and welcomes guests and visitors. This hot springs discriminates against single males. Single non-member males must be accompanied by a member or significant other. The hot springs pool is ​limited to 60 patrons. Changing rooms are provided with toilets and showers. Showers are hot water only from the mineral spring. Camping is not available at this time. Alcohol may be brought into the facility, but Desert Reef Hot Spring reserves the absolute right to limit alcohol consumption by any patron. Desert Reef is not friendly. Dogs must remain in the car. No cameras, radios, TVs, cell phones, pagers, computers, PDAs or other communication or recording devices are permitted in the facility. ​No glass of any type is allowed in the pool area. Clothing is optional. Youtube Video on Desert Reef Hot Springs is below.